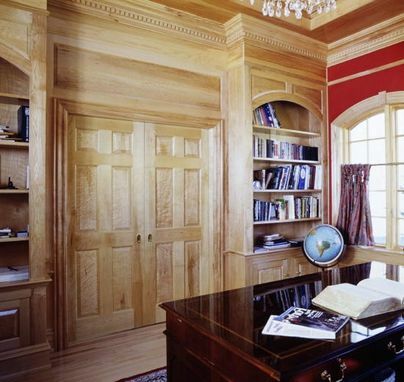 Solid hard rock maple and rare birds-eye maple are used to dramatic effect in this lofty, light-bathed home office. The stylish custom arch-topped windows and bookcases are trimmed with a four-piece crown dentil detail, where two-step sofit detailing allows for a lighted valance to accentuate the intricate moulding detail. 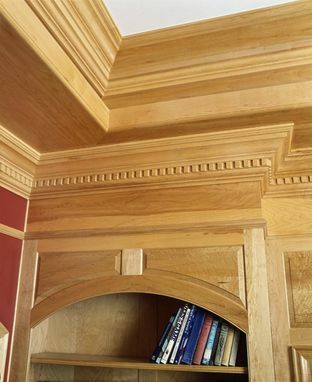 Sliding pocket doors are flanked on either side by two elegantly arched bookcases.